Location: Sainte-Luce-sur-Loire, in the Loire-Atlantique departement of France (Pays de la Loire Region). Notes: Château de Chassay serves as Mayor of the town of Sainte-Luce-sur-Loire (Loire-Atlantique). 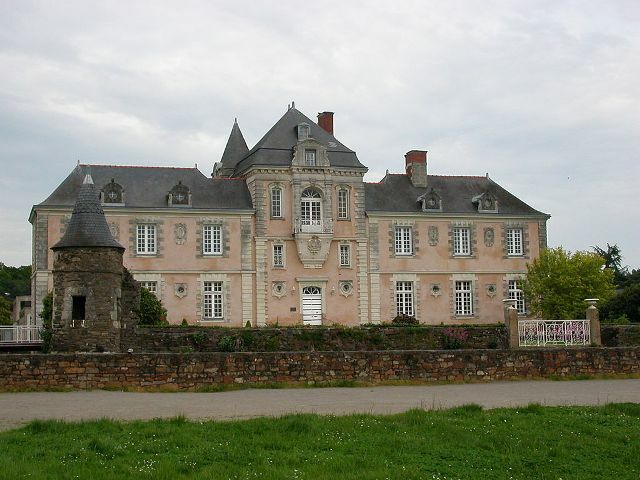 A castle existed from 550 on the site of an ancient Roman villa called Cariacum, located on the route of the oldest Roman road in the region (already mentioned in the third century) and leading to Nantes Doulon lived through him Gallo-Roman times. A document dated 1096 mentions the castle as Nantes bishops had to Chasseil former name Chassay. In the middle of the fifteenth century of Amaury Arcigné bishop does enclose a moat but Francis II of Britain seizes it, turns it into a hunting lodge and it was not until 1500 that he went to the bishopric. Henri IV and his entourage will spend April 13, 1598. In 1683, in statements provided by the Bishop of Nantes, Gilles de Beauvau, for the reformation of its areas, mention is made of two buildings: the "Little Castle" and "Grand Mansion". "Little Castle Chassais", the current building. The "Grand Manor Chessail" consists of three contiguous body home he had many dependencies (gardens, greenhouse, farm, wine press, stables, stables ...) Abandoned at an unspecified date, it seems that it was located north of small castle, thus designating the small castle as a principal residence. The abandoned buildings and became farm buildings were razed during the period when the area was property of artifiel insemination center (twentieth century). Sold as national property January 27, 1791 in Nantes shipowner Dubois-Violette for 109,000 pounds. It is sold and abandoned until its purchase in 1827 by the Countess of Bondy. In 1956, belonging to the family of the Fremond Merveillère, it is sold to a union of agricultural cooperatives breeding and animal insemination. In 1974 it was bought by the municipality, who set the town hall. It also served until 2007 during the summer lights, giant screen on which were projected pyrotechnic tales of faerie society.